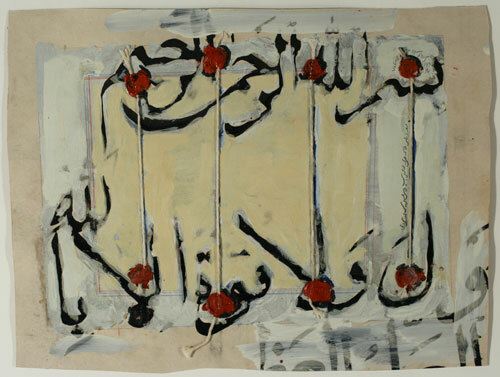 In this work Armajani explores calligraphic forms, wryly juxtaposing a legible prayer in Arabic at the top with two rows of letters in Arabic script at the bottom.1 The prayer (“in the name of God, the Merciful, the Compassionate”), known simply as bismillah after its first word, is one of the most ubiquitous phrases in Muslim religious practice. Some of the letters in the lower portion of the canvas are decipherable, but they do not form recognizable words. Although he would later turn to sculpture, Armajani refers to the years 1956–64 as his “Persian period” due to his involvement with calligraphy.2 The relationship between word and image is particularly important to Iranian modernists such as Armajani, Parviz Tanavoli, and Charles Hossein Zenderoudi, who sought to create a specifically contemporary Persian visual language that balanced their cultural heritage with modernity’s universalism. 1. Although Arabic and Persian are both written in a script known as Arabic, and their alphabets have many letters in common, they are two completely different languages. Arabic is a Semitic language, while Persian is an Indo-European language. 2. Email message from Siah Armajani to Fereshteh Daftari, November 28, 2010. 3. Shiva Balaghi, “Iranian Visual Arts in ‘the Century of Machinery, Speed, and the Atom’: Rethinking Modernity,” in Picturing Iran: Art, Society, and Revolution, ed. Shiva Balaghi and Lynn Gumpert (London and New York: I.B. Tauris and Grey Art Gallery, New York University, 2002), 31. Dimensions 10 1/4 x 13 in.